I went out yesterday morning to Rosemont but came up empty. I returned home, ate some food, and then left again to do some errands. My cell phone was lost or stolen on New Year’s, and while I enjoyed the brief break from having a cell phone it’s so much harder to plan and connect with people without one. My first step was to go to a place near Plaza St Hubert to get an old phone fixed, which will unfortunately take a few weeks due to needing to have the parts shipped from China. The second step was to get a new SIM card from Rogers, the closest store of theirs being on St Denis and Mont Royal. 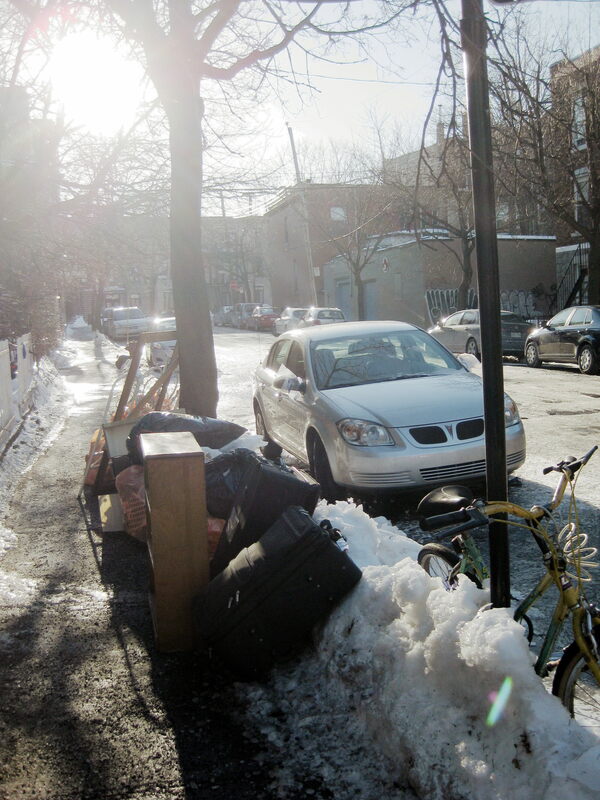 Yesterday was very sunny and relatively warm, it actually felt a lot like spring. Energized, I decided to bike to Rogers from Rosemont in a way that would bring me through a bit of the Plateau trash route (west of St Denis). The pick-up happens around 7-9. You’re not supposed to put out your trash before 4pm but there are always some who put it out early, in this case from around 12-2pm. The person ended up being Brother Andre, an important figure among Catholics in Montreal. He’s made of plaster and as such is probably fairly old. He’s in good condition for his age, just a couple of little chips. There wasn’t much else in the bags and I continued on my mission. 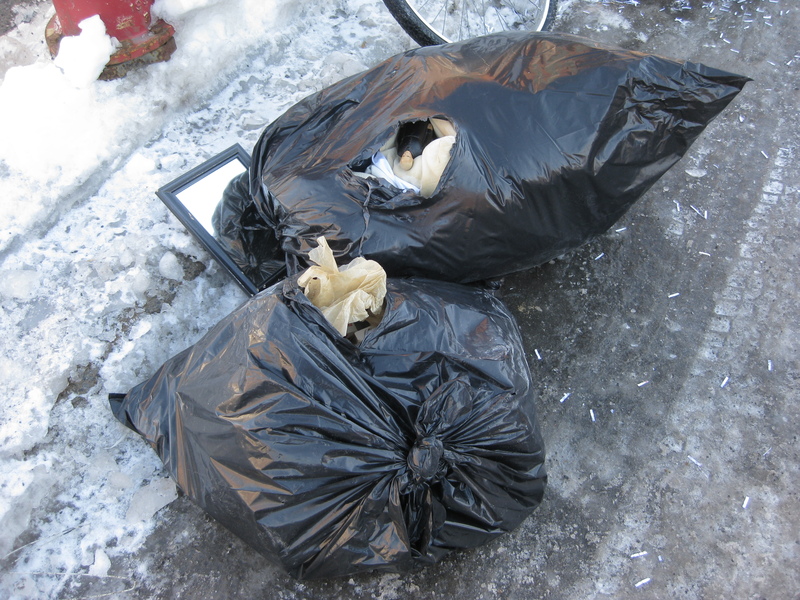 After finishing my business at the Rogers store I continued casually browsing the streets of the Plateau. I noticed this pile looking down Clermont and decided to check it out. A young guy was bringing down more bags and I asked him if he was moving. He told me the things belonged to his girlfriend who had moved to Berlin, she apparently wanted a fresh start. 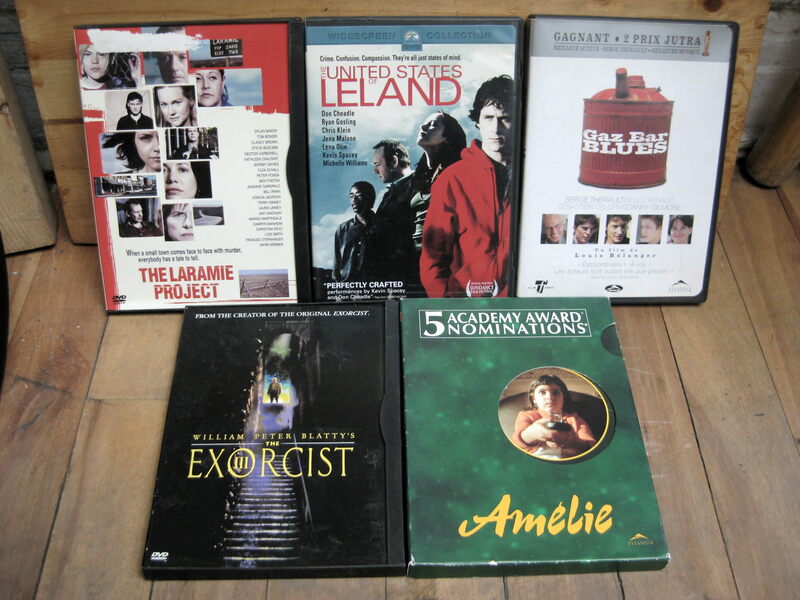 There were a bunch of DVDs, these are the ones that looked to be in good, mostly unscratched condition. I haven’t seen any of these, though I’ve heard good things about a lot of them. Not pictured is “Spirited Away,” which might have been borrowed by a room-mate before I got around to taking this picture. There was also a nice little collection of records. 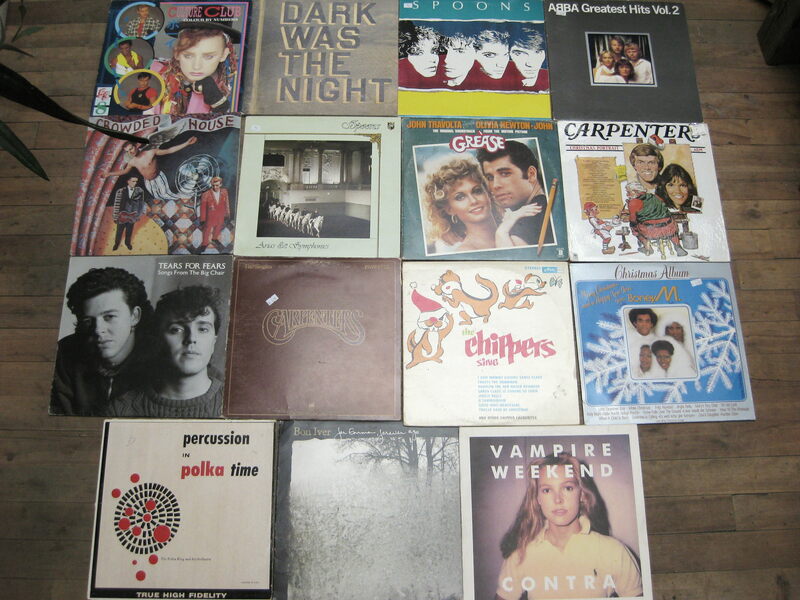 There’s some great stuff here, including a couple newer ones (Vampire Weekend, Dark Was The Night) made after the recent resurgence in the popularity of LPs. All of these are in good to excellent condition and should sell pretty quickly at a yard sale. I also found four working calculators and a couple of cellphones. The cell phones are only good for parts but will sell on Ebay, though I’ll wait until I have a few more before I list them as a lot. 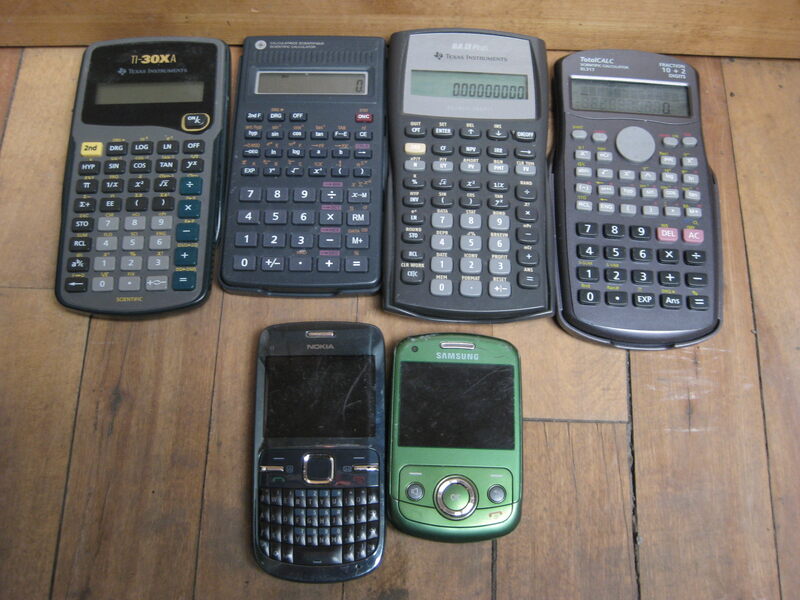 The most valuable calculator is the BA-II Plus (2nd from right) – it’s made for accounting calculations and sells for around 15-20$ on Ebay. The others can bring me a few dollars each at a yard sale. 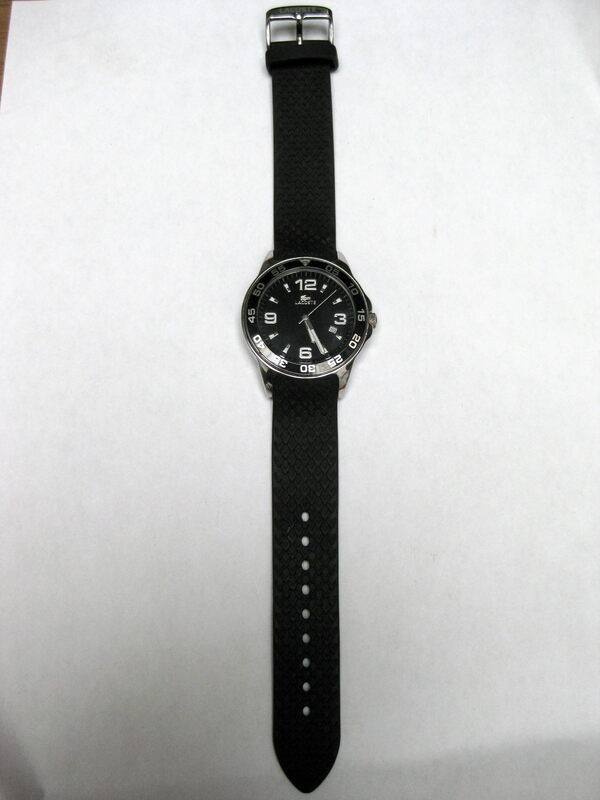 My most valuable find, however, was probably this nearly mint condition Lacoste watch. It’s an excellent quality watch, not a Rolex or a Cartier but still quite good. It looks hardly used and has a working battery to boot. 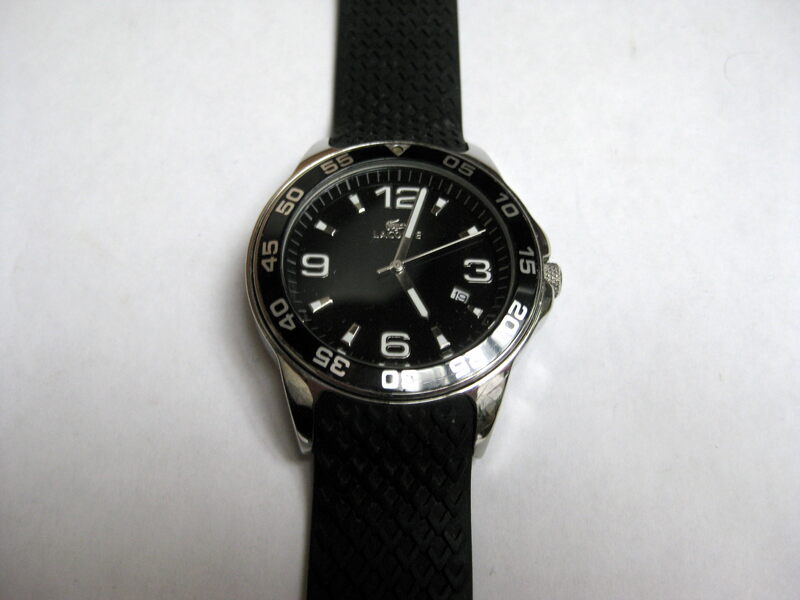 I did a bit of research and found this very similar watch which sold on Ebay UK for £50.01 (90$ Canadian). I went back to this spot later thinking that there could be more to find. By the time I got there though most of the good stuff had been taken, including several bags full of clothes that had been there earlier. I was glad to see that someone else had saved what I couldn’t. Still feeling energetic I went to check out a Thursday evening Rosemont route didn’t find squat. All of my “profit” came from my casual, midday outing, proving that so much of trash picking is being in the right place at the right time. In the end I found about 150$ worth of stuff, my best day in monetary terms in quite some time. The weather is supposed to be quite warm next week. I hope to take advantage and make some cash! That’s a major bummer about your phone. A few finds to bring in some needed bucks! love the Brother Andre statue. am not very religious, but love it just the same. Indeed, everyone could use a bit of “watching over”, grin. That statues is sort of creepy! Nice watch though! I love that little statue! Not quite sure why I am so drawn to him. came back for another look at brother andre. 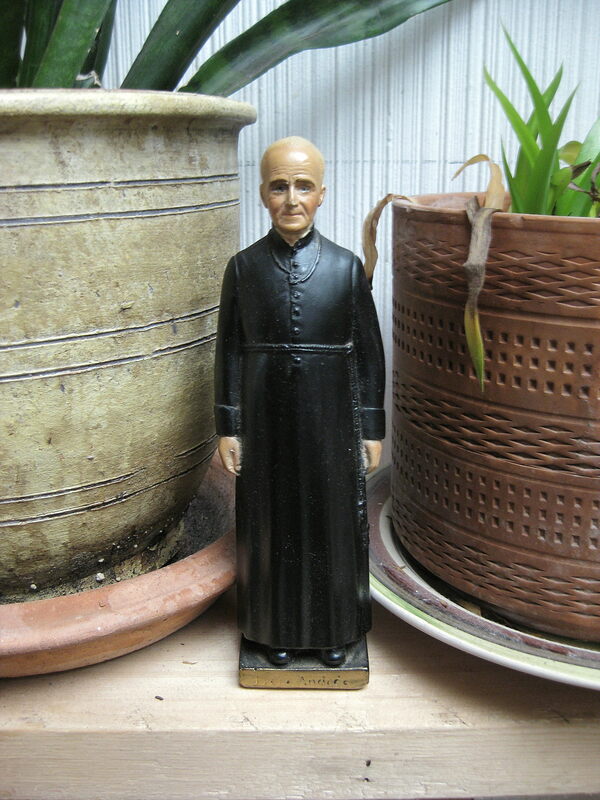 did some googling and found quite an assortment of similar brother andre statues, priced from 25 dollars, to 125 dollars. however, not a one had the cheerful / slightly quizzical demeanor of your brother andre. all were much more severe/sombre looking. it might be worth your while to do a bit of searching to see if yours is unique in some fashion/made by someone of note. does yours have any makers marks/signature on it? lot number? etc?